Press Secretary Sarah Huckabee Sanders graduated at the top of her class … especially in two courses: Deflect & Distract, and General Bull Poop. She is such a genuine whiz at these things that I sometimes wonder if it is really she who is running the government! Now, lest you wonder, yes, I am being snarky … very, very snarky. The woman is, in truth, about as intelligent, well-spoken, and knowledgeable as a stone in the back yard. Reporter #1 (Steven): Two questions about the President’s statement this morning. What does “Get ready Russia” mean? Is the United States planning to target Russian assets, personnel in Syria as part of the attack that the President himself said is coming — the missiles are coming? What does it mean? Sanders: We’re maintaining that we have a number of options, and all of those options are still on the table. Final decisions haven’t been made yet on that front. Reporter #1: So does it mean anything at all? What does it mean? Reporter #2 (Mike): Two quick questions. You said that the final decision on Syria hasn’t been made yet. Does the President’s emoting on Twitter complicate the planning on this or present a national security risk? Reporter #3 (Hallie): Sarah, two on Syria. Given your comments given here at the podium, given the President’s tweets this morning, is the White House prepared for the possibility of direct military engagement with Russia? Reporter #3: It sounds like a yes. Just — I want to be clear. Reporter #3: And then let me ask that follow-up, too. The President, as you know, back in 2013, talked about why, when it comes to Syria, we can’t just, in his words, “be quiet and, if we attack at all, catch them by surprise.” Obviously, the President didn’t talk about a date or a time for any kind of attack on Syria, but he did talk about, as Steven points out, “get ready” for something. Why this time is the President not taking his own advice and being “quiet,” as he put it? Reporter #3: So that 48-hour timetable is out the window that he talked about Monday? We should disregard that? Reporter #4 (Jon): But, Sarah, the President was direct in talking about missiles. He said, “Get ready Russia, because they will be coming, nice and new and ‘smart!’” Why is the President telegraphing military intentions on Twitter; announcing, effectively, an attack on Twitter? Reporter #7 (Blake): Sarah, you just said that the intelligence provided certainly paints a different picture, and that the President holds Syria and Russia responsible for the attack. However, earlier this morning, the Defense Secretary said, “We’re still assessing the intelligence — ourselves…We’re still working on this.” So what has changed over the last handful of hours from when the Defense Secretary said, “We’re still assessing the intelligence,” and now, to where you clearly point the finger at Russia and Syria? Sanders: As I just stated to both Jeff and Jonathan, Russia holds some responsibility in the fact that they guaranteed that Syria wouldn’t use chemical weapons again, and they did. They also hold some responsibility in the fact that they have the six U.N. resolutions that they vetoed to help protect Assad. Both of those things lie at Russia’s feet in terms of responsibility in this process. Reporter #7: So then you still are assessing the intelligence then as the Defense Secretary stated before? Reporter #9 (April): What about an enemy, though? Are they an enemy, though, of America at this point? Sanders: That’s something that Russia needs to play a role in determining. We hope that they will continue — or not continue, I’m sorry, to be a bad actor, and make some changes in their behavior. But that’s something that Russia will have to play a role in determining. Reporter #9: Sarah, as you say, “All options are on the table” when it comes to Syria and Russia. Has diplomacy been exhausted? That’s an option, as well. Sanders: As I said, all options are on the table. Again, all options are on the table. That contains a number of different things. Reporter #9: So diplomacy could still be in play? Reporter #10 (Steve): Sarah, Senator Markey, a member of the Foreign Relations Committee, said today that the President must come to Congress for authorization prior to another military strike on Syria. And there are others who are also saying that. Does the administration intend to do that? And if not, why not? Sanders: Obviously, the administration will follow whatever laws and regulations are necessary for any actions that we take. Because we haven’t laid out any specific actions that we plan to take, I can’t tell you exactly what needs we would have to go to Congress with. Reporter #11 (Jim): It sounds like the President hasn’t really left a lot of wiggle room. You said that all options are on the table, but when the President says, “Get ready Russia…they will be coming,” the missiles are coming, how is that anything but an announcement of a pending airstrike? Sanders: That’s certainly one option, but that doesn’t mean it’s the only option or the only thing that the President may or may not do. Just because he does one thing doesn’t mean he can’t do a number of other actions as well. Newspeak, anybody? My best guess is that Sanders learned a new word this week, “option(s)”, and that she is trying it out in every sentence just to make sure it flies, for she used it no less than 37 times just in this excerpt. And for this, we pay her $165,000 per year. Three times as much as I ever made in a single year, and I could actually speak intelligently! Her responses told us nothing we didn’t already know, but what they did tell us is that she doesn’t understand the situation. Neither does her boss, but he doesn’t get to be the focus of this post. A line from an old commercial from decades ago comes to mind: A mind is a terrible thing to waste. I have a very dear friend who I always thought was the absolute world-class master at deflecting from questions he doesn’t want to answer, and distracting your attention elsewhere. But Ms. Sanders makes him look like a novice! All press secretaries do the deflect and distract routine to an extent, but I have never seen one use it in lieu of actual knowledge. Most, if they know something and are at liberty to answer the question, will answer it. We really do need an answer to the one about why Trump is tweeting taunts to Putin, and also why he is advertising his ‘policy & intent’ to the entire world!!! Don’t look for any answers from Sarah, though, unless you wish to know how to make a pecan pie or wish to know more about ‘options’. This entry was tagged civilian casualties, Donald Trump, foreign policy on Twitter, missile strike against Syria, press briefing 04-11-2018, press secretary salary, Sarah Huckabee Sanders, the work 'option'. Bookmark the permalink. 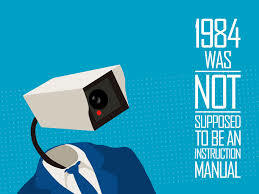 Right out of ‘1984’ … A mind is a terrible thing to waste! That is, if you have one! Whereupon the Defense Secretary “Mad Dog” General James Mattis enters the scene. Normally the general gives his counsel but does not impose his will on the president but this time, the general lets the president know that he is not allowed anywhere near this decision making and that he’d better not tweet again. General Mattis has been waiting on the findings of an independent group of experts to verify that a chemical attack/ nerve gas was used on civilians in the Douma, Syria area around the 7th of April. That was verified today. But there is the second step in the verification process. The US needs to determine that it was the Assad regime that disseminated among the Syrian citizens. Does the chemistry make-up match the stockpile that the Syrian government had in the past, that Russia was supposed to take care of, ages ago. In short, General Mattis has taken the initial step of verification before any action would be taken. If it is determined that President Bashar al-Assad did act to quicken his control of this area by resorting to using this chemical weaponry to where the international community cannot buy Russian and Syrian officials’ denials, then General Mattis will act in co-ordination with other countries. Which country does what has yet to be determined. There is no way that the US was ever going to act within a 48 hour time period. And the president has been instructed to remain mum. Even Mr. Bolton would have concurred with this. 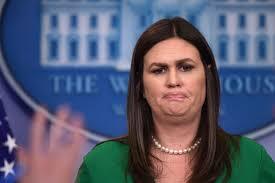 You are right to say that Sarah Huckabee Saunders couldn’t just blurt out that her boss just acted like a fool by tweeting out something without due deliberation, study and co-ordination. Thanks, Gronda! Even though instructed to remain mum, I don’t expect him to, for Trump basically does what Trump wants, and if a whim strikes him to fire off another idiotic tweet, I imagine he will. Unless Kelly has hidden his tweeting machine! Personally, I don’t know how Sarah Huckabee Sanders sleeps at night, for all the lies and half-truths she tells every single day. I wouldn’t have her job for a million dollars a year! Yes, smugness denotes arrogance and, as you say, sometimes covering a lie. Lack of depth … what an appropriate phrase for everyone in our current administration! Sigh. Thanks, Scottie!!! I used to do that fairly often, especially in my Idiot of the Week features, but I’ve somewhat gotten away from it … no real reason, just didn’t use it. I’ll try to do it more often, since you like it! I have a lot of fun with it! I’m inclined to go with the first explanation, that it is all for show, so that we don’t start to think he’s getting too cozy with Putin. It was, nonetheless, highly inappropriate, but then, what has he done that WASN’T highly inappropriate??? Molesting women, bashing minorities, openly calling for violence and praising KKK and neo-Nazis, and the list would take an entire notebook!!! I vote we get rid of him soon!!! Your description of Sanders is far more charitable than I could manage, Jill. I dislike intensely the sneer she wears on her face – as well as everything else about her. Thanks for this great post! Wow!!! I certainly did not mean to be charitable toward her! I have zero respect for her, for it is obvious that she doesn’t mind telling lie after lie after lie, all to stay in the good graces of King Donald. And yes, that sneer is her trademark and she doesn’t even treat the reporters with respect, but rather as errant kindergarten children whom she must merely tolerate. Thanks, John!!! I know that wasn’t your intention, Jill. Every time I see her, my second language (obscene) becomes dominant. Yes, she is terribly disrespectful to the Press. I’m impressed that they take the high road with her. 😀 I cannot imagine you using your second language! I suspect the press take the high road because they don’t wish to be banned … a few have been in the early days, and that’s a lesson to them all. Frankly, I think the daily press briefings have become pointless, for we never actually learn any truths from them, and typically I avoid them, but this one jumped in my face and was so ludicrous that I couldn’t resist a bit of humour at her expense. I like to taunt the idiots, y’know! 😀 Hugs, John!!! She is definitely qualified. That reminds me … I still haven’t done an Idiot of the Week post yet this year! What is wrong with me??? Right! Wassa matta you? There are TONS of idiots to choose from! Big hugs! Careful – don’t give Donny a reason to lock you up! No judgment on my part. I would hate to be press secretary for this Administration. I think her personal options are: talk in circles or quit. I would have been looking for work but then I’m sure her own daddy gives her pep-talks so that she stays on to be humiliated and while serving God and country. Each time I think things can’t get worse… they do. There isn’t enough money to make me work for Trump, but I cannot say I have any respect or admiration for those who do, for I see it as they’ve traded their conscience for a dream of power & money. Sean Spicer quickly learned that it was a no-win situation and not worth staying on and having to sacrifice his values. Sanders? I doubt she has many values, from what I have seen thus far. I agree. “for God and country” has to have its limits in one’s conscience – especially when you are expected to blatanly lie or misrepresent an obvious truth. As the Cheeto in Chief would say (seeing as he also has learned a new word), what a disgrace!